BOSTON — On October 18, the MBTA celebrated the upcoming addition of its brand new catamaran ferry, the Champion, with a boat christening ceremony of the new ferry by MBTA General Manager Luis Manuel Ramírez, with Ramírez also meeting with the new vessel’s crew and MBTA ferry management staff. "The introduction of the Champion and the upcoming introduction of the second brand new catamaran, the Glory, mark smart investments in Greater Boston water transportation," said Ramírez. "The MBTA is pleased to welcome them into the fleet." 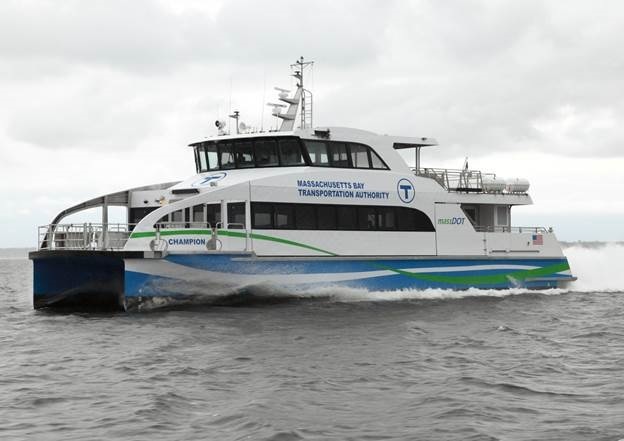 Built by Gladding-Hearn Shipbuilding, the Champion is a high-speed catamaran ferry with a 150-passenger capacity, supporting the MBTA's commuter boat service between the communities of Hull, Hingham, and Logan Airport in East Boston and Long Wharf in Boston. Gladding-Hearn also constructed the MBTA's current high speed ferries, the Lightning and the Flying Cloud, in 1996 and is a leader in constructing comfortable, fast vessels known for their speed and reliability. In addition to improving service reliability, the procurement of the Champion allows the MBTA to rely on its own vessels while also providing a spare ferry when MBTA-owned boats are periodically taken out of service for maintenance and Coast Guard inspections. Including state-of-the-art flat screen passenger information systems, the Champion also features energy-efficient LED lighting, carpeted interior decks, tables and seating to accommodate 110 passengers and ADA wheelchair positions, a concession stand, and luggage racks. Thirty-eight weekday trips operate between Hingham/Hull/Logan Airport and Boston with forty weekday trips on Friday only. Weekend service operates between Hingham/Hull/Logan Airport and Boston, with 32 Saturday trips and 28 Sunday trips from Memorial Day weekend through Columbus Day weekend. Service to George’s Island is currently offered seasonally, with four weekday trips and nine weekend trips from Memorial Day weekend through Columbus Day weekend, as determined by the Boston Harbor Islands. The MBTA’s ferry service has the highest rate of on-time performance—at nearly 98 percent—as well as the highest rating of customer satisfaction among all MBTA services. The Champion is named to honor the legacy of Master Shipbuilder Donald McKay's Champion of the Seas clipper, which set a record for the fastest day’s run in 24 hours in 1854. With the original Champion of the Seas designed in east Boston, the MBTA’s new Champion honors this idea as the new ferry will service the same community. McKay also designed clippers named the Flying Cloud and the Lightning, which have also been used to name MBTA vessels. A second brand new catamaran ferry will be coming into service at the end of the year named Glory to continue honoring McKay's legacy and the design of his Glory of the Seas clipper. The cost of each new vessel is approximately $5.7 million per boat supported with federal funds. Find more information on MBTA commuter boats and ferries and the MassDOT Water Transportation Study (PDF).